The backbone of every British garden, no matter its size, shape or aspect; is the evergreen shrub. They provide us with year-round colour and allow our favourite spring and summer flowers to stand out in contrast and shine. They can thrive in those difficult shaded borders and one of the best attributes of evergreen shrubs is that they often require very little maintenance, allowing us to focus on all those other garden jobs on our to-do lists. We have put together six of our favourite Evergreen Shrubs in a special collection, all of which are low-maintenance, will work well in gardens of any size and are on offer in the DC Thomson Shop. 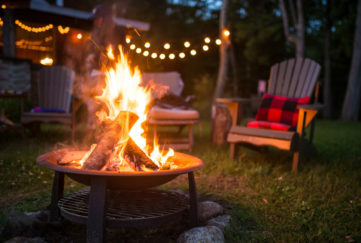 Keep reading to find out which shrubs made the cut! 1 Skimmia Japonica Rubella: This aromatic dwarf shrub is hardy and versatile. Skimmia Japonica Rubella thrives in sunny and partially shaded locations. Its compact habit makes it manageable and well suited for use in borders, patio pots or containers. The red buds are produced all-year-round and will offer much needed colour during winter and the early spring. The leaves are broad and a rich, dark green colour giving this shrub quite a solid, chunky look for its small size. White flowers appear from April to May on this plant which reaches a height of around 80cm. 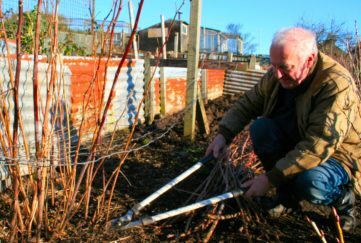 You can prune lightly in spring if desired. 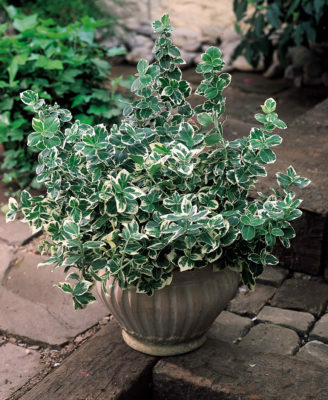 2 Euonymus Fortunei Emerald Gaiety: Our favourite shrub, the Euonymus Emerald Gaiety has a bushy habit with gorgeous glossy green leaves which feature silver-white margins and veining. During winter a subtle pink coloured tinge appears. Growing to 60cm its smaller in height than the Skimmia Japonica Rubella and has smaller, more dainty foliage. This shrub looks particularly effective in patio pots and will also look good in your borders, especially in early spring amongst emerging Crocuses and Tulips. The Emerald Gaiety will do well in sunny and in partially shaded locations. 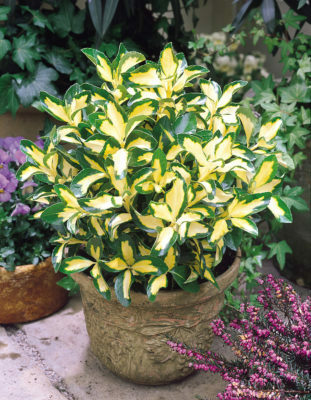 3 Euonymus Blonde Beauty: This Euonymus has bright creamy-yellow and dark green markings on its glossy leaves. 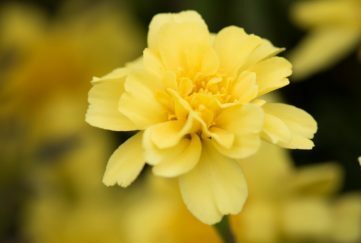 Growing to the same compact 60cm in height as the Emerald Gaiety, Blonde Beauty is ideal as ground cover and will give life to rockeries and borders alike and will help suppress the weeds. The Blonde Beauty flourishes in well drained, fertile soil types and thrives in shaded locations as well as sunny ones. Very little pruning is required with Blonde Beauty but you can remove any unwanted or malformed shoots in spring if desired. 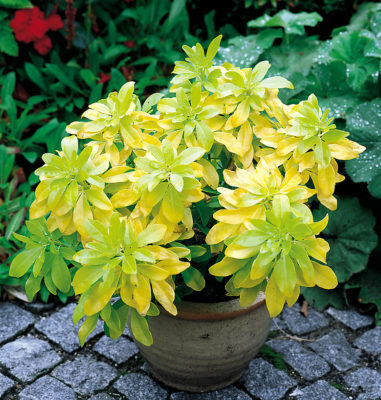 4 Choisya Ternata Sundance: Also known as Mexican Orange Blossom, this glossy golden green shrub holds the RHS Award of Garden Merit in recognition of its reliable performance, brilliant colour and form and for its resistance to pests and diseases. In May, fragrant white flowers sprinkle across its glossy foliage. Choisya Ternate Sundance needs very little pruning once established and will thrive in west facing aspects and partially shaded locations. This evergreen shrub grows to a height and spread of around 150cm which makes it an excellent choice for the middle or back of your borders. 5 Ceonothus Thyrsiflorus Var Repens: Another RHS Award winner of Garden Merit, this colourful evergreen shrub really is something special with its lilac coloured panicles which bloom in spring through to early summer. The Californian Lilac, as it’s also known, has a spreading and cascading habit making it ideal for ground cover or in elevated patio pots and containers where the dark green spindle-like foliage can be appreciated all-year-round. For best results we recommend planting in sheltered locations, either sunny or partially shaded. 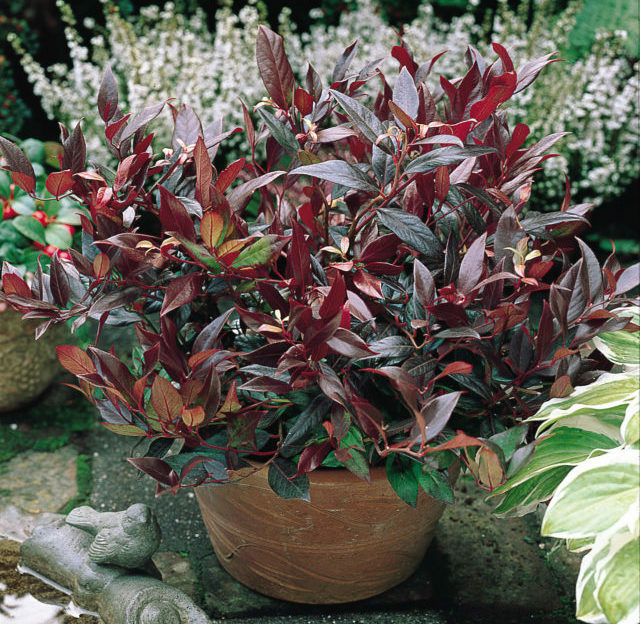 6 Leucothoe Scarletta: This is one for lovers of red foliage, Leucothoe Scarletta has bright red leaves which become deeper and darker as the year goes on and will produce white flowers during spring. The Leucothoe Scarletta is superb for suppressing weeds and giving autumnal colour to the garden. A very low-maintenance shrub that grows 45-60cm in height, forming a dome-like shape. 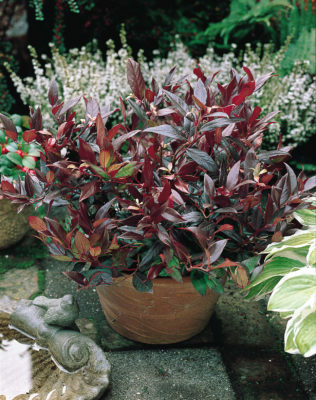 If you’re searching for a shrub that will thrive in full shade, then Leucothoe Scarletta is a great option and well worth looking into as they perform best in shaded locations. For best results plant in hummus rich, neutral to acidic soil. Each of these Evergreen shrubs are hardy and versatile enough to be used in patio pots, containers or in your borders. Whichever Evergreen Shrub you are after we have you covered! Click here now to take advantage of our Dwarf Evergreen Shrub offers.